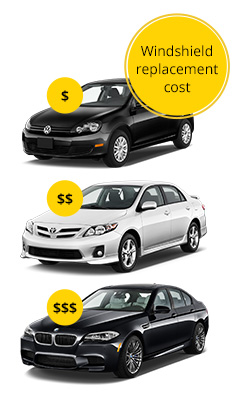 Windshield Replacement Cost: Compare Prices, Read Reviews, Get Quotes & Save Now! When it comes to the safety features of your vehicle, the windshield is probably not the first thing that comes to mind. Instead you probably think of your seat belts, airbags, or the frame of your car. It may surprise you to learn that your windshield is actually essential to the functionality of your airbags, and the strength of your car frame. Your windshield can even save you from the serious injuries, and even possible death, that occur when you fail to wear your seat belt, or your seat belt doesn't work properly. An example of this comes from a news report in May of 2015 from Texas. A 60 year old woman was lodged and became stuck in her windshield after getting into a car accident. While it may seem odd for this to happen–this is precisely what the windshield was made for, in the event that your seat belt is not properly worn when an accident occurs. That's why we have a great system in place to find effective yet cost effective and cheap windshield replacement quotes. 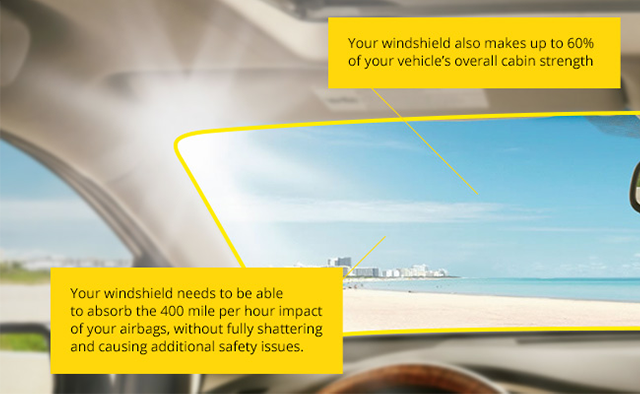 The purpose of a car windshield is multi-faceted, and much more important than you probably know. That's why we provide you with the best service with quality in mind. It's common sense that a windshield is essential to keeping your vision clear while on the road. However, did you know that it also makes up to 60% of your vehicle's overall cabin strength? The right windshield can hold 1.5 times your vehicle's weight, and keep your car's roof from crushing you in up to 5 consecutive rollovers. In fact, a car's windshield is also an important partner to your airbags. When your airbags deploy, they exit the compartment at a speed of over 400 miles per hour. Instead of hitting you with full force, they first bounce off of your windshield, and then pillow you from possible impact. A windshield needs to be able to absorb the 400 mile per hour impact of your airbags, without fully shattering and causing additional safety issues. Now, let's say that your airbags don't go off for some reason. A car's windshield is engineered to keep passengers inside of the vehicle, and prevent them from ejecting (such as the example mentioned at the beginning of this article). That may seem counterproductive, but if you are ejected from a vehicle, you are highly likely to die from the impact of hitting a tree, the road, or another vehicle with your body. On a lighter note, the windshield also greatly affects the aerodynamics of the vehicle, which helps improve gas mileage and provide a smooth driving experience. Additionally, the windshield of a vehicle is integral to proper insulation on hot summer days and cold winter nights. Modern vehicles include sensors in the windshield to detect rain, and to display important vehicle information without breaking your line of sight while driving. Your windshield is an integral structural component of your vehicle that keeps you safe and comfortable as you drive. However, the level of safety and structural support that a windshield provides for your vehicle depends greatly on how it is made, it's level of quality, and how it is installed. There are two important keys to properly installed windshield glass. The first key, is that the frame of the vehicle is in good shape. The second key, is that the windshield has a firm, bubble-free, and fully dried seal to the vehicle. The frame of the vehicle will largely determine how well glass adheres and seals to the vehicle. If there are any bends, dents, or rust on the vehicle's frame, it will compromise the strength and endurance of the glass seal. A glass installer will first start by examining your vehicle's frame, especially the frame for the windshield. Using a windshield knife, the installer will cut the seal around your damaged windshield glass, and then utilize force to remove the windshield. Before they can go any further, they must cut down any remaining seal around the glass, as close to the vehicle frame as possible. After removing the broken bits of glass and old adhesive, the installer will then clean and prime the frame, to ensure no dust or debris gets between the adhesive, the glass, or the vehicle frame. Next, the glass installer will “dry set” your vehicle's windshield, by lowering the windshield glass into the frame and marking exactly where it will fit. Once the dry set is complete, the installer will remove the glass and take a tool that resembles a caulking-gun to begin applying urethane adhesive to the mating flange of the vehicle's frame. This adhesive has to be in one continuous, unbroken bead all the way around the glass opening. A glass installer will now carefully lower the windshield glass into the frame, using their markings from earlier. When the glass is in place, the installer will press firmly down so the bead of adhesive lightly spreads. The last step a glass installer takes, is installing any additional vehicle trim and the rearview mirror. Before he/she leaves, your installer will give you a safe drive time–which is when you can drive the vehicle again. Urethane typically takes around 1 hour to properly dry and seal. It is very important you do not drive before the seal is fully dried, as it can cause the seal to have bubbles. A weak seal puts you at risk, as a properly installed windshield comprises up to 60% of your vehicle's overall cabin strength. In the event of an accident, a windshield should be able to hold up to 1.5 times your vehicle's weight, and survive 3 consecutive rollovers without the cabin crushing inward. If the seal is not properly dried, it will not just compromise the strength of your windshield, but of your entire vehicle. Most people get their windshield replaced every 7 years from normal wear and tear. Over time the seal around the windshield begins to weaken, and the daily stresses of sun, wind, and rain begin to weaken the glass itself. However, without proper care and under environmentally stressful circumstances, the lifespan of your windshield can dramatically ecrease. Windshield damage can occur for a number of reasons. Extreme weather and humidity is one of the more surprising causes of windshield damage. 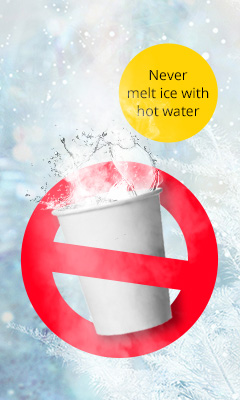 This also means that it's a bad idea to pour hot water on your windshield during the winter to defrost the glass, as well as pour cold water on ​it​ to defog the glass during humid summers. It's important to understand that a vehicle's windshield is comprised of thousands of molecular bonds. With a decrease or increase in temperature and moisture, ​a ​windshield expands and then shrinks. Over time, this expansion and shrinking causes those bonds to weaken, making it much easier for your windshield to become scratched. Speaking of scratches–those don't always occur from things hitting your windshield (though it is possible, and happens every day). A lot of the time scratches occur because you haven't properly cleaned your windshield and maintained the wipers. Keeping your windshield clean isn't just good for your vision, it also helps keep your windshield from prematurely weakening or being scratched and pitted from dirt and debris. Dragging dry, cracked, or dirty windshield wipers across windshield glass can cause scratches that eventually grow and turn into long cracks and deep pits. It's important that ​the ​wipers make full contact with your glass, in order to effectively clean the glass, in order to effectively clean the glass, and to prevent dragging debris across the glass surface. In fact, what starts out as a simple scratch or small chip can easily turn into serious damage to your windshield's glass just by driving on rough road, or going over potholes. Because the molecular bonds are now damaged, all it takes is your vehicle vibrating at just the right moment for that scratch to turn into a crack and spider out. Once your vehicle's windshield has a scratch, pit, or crack, it's important you either repair or replace it right away. After all, if you get into an accident, you don't want one of the most important safety features of your car to be less effective! But how do you know when you need to repair or you need to replace your windshield? A general rule to follow, is that if the damage in question is smaller than a quarter, and has caused no loss of glass (no pieces have fallen out), then you're safe to simply get it repaired. However, after the damage has grown to the size of a quarter or larger, repairing it will not restore it close enough to its original structural strength and integrity. When the damage is that large, or glass has fallen out of your windshield, it is strongly advised that you get your windshield replaced. For your safety, and the safety of your loved ones, it is imperative that you do not attempt to replace or repair your windshield on your own. While purchasing and installing the glass yourself may seem like the most cost effective way to handle damaged windshield glass, it is without a doubt the most dangerous way to resolve the problem. Glass installers must go through special training because the way your glass fits and seals on your vehicle can be the difference between life or death in an accident. Trying to do this on your own is simply not a good idea. Plus, even if you don't get into an accident, poorly installed windshield glass will often pop out of the frame, or need to be replaced much sooner. Windshield replacement cost varies based on a few different things. First of all, the make, model, and age of your vehicle. If you have a special vehicle, the glass may cost more than what you would pay for a generic sedan. If your vehicle has special sensors in the windshield, then that will also cost more than a normal windshield would. When a vehicle's frame is damaged, it may cost more to replace a windshield simply because extra measures must be taken to properly fit and install your windshield in a safe manner, if an installer is able to do so at all. Some installers will not install your windshield if your car's frame is damaged to a certain point. Make sure to call ahead of time to find out their policy. Those who have comprehensive insurance coverage may find that their windshield cost is partially, or even fully, covered. That would depend on the deductible you have with your insurance. For example, if your deductible is $500, then it is unlikely that the insurance company would cover your replacement, because most cost less than $500. However, if you had a deductible of $100, then you'd simply pay that deductible and your insurance would cover the rest of the replacement cost. In some states, windshield this is required to be covered by your insurance company. And the good news is that this is considered a "no fault" claim, which means your insurance cost will not increase because of the windshield replacement, and will not mark against your driving record. The best way to the cost of your quote, is to use a our new, sophisticated real-time quote tool at www.Glass.net. Our quote tool is 100% free of charge and empowers consumers to get up to 5 competing local quotes from independent local glass shops in their area. With your free quote will come important information, such as the credentials and training of the shop, if they guarantee their work, what kind of glass they use, and even consumer-generated star reviews. Once you receive your windshield replacement quote, you can call the shop of your choice and discuss insurance and payment options. The local glass shops are happy to help you find the most affordable and convenient way to replace any car windshield. Glass.net was created to educate and protect consumers, just like you, when making the important safety decision regarding your vehicle's windshield glass. There's no better time than now to start saving money on something that simply shouldn't be put off - and that is replacing your vehicle's windshield. So go ahead and click here to claim your right now! Get your totally free windshield replacement quote now! Very professional and about business,they explained everything so I knew exactly what was going on with my vehicle. Before I could sit down and relax they were handing me my keys. Job well done . I could not have been more pleased with the quality of the people and the glass work that came to do the work at my home. The price was near the quote, and was the best. Taylor was a great rep for Glass America. Top notch, very pleasant, quick and friendly. Great job! 5 stars! I had 2 vehicles done, and I left a 5 star for the first one also. Taylor came and did both my vehicles quick as could be. Efficient and friendly. Happy to have had him do the work for us. Great job, and now after a couple of days, it's obvious we are not going to have any problems. Thank you so much for sending Taylor. Since you're already here, why not allow us to give you up to 5 competing prices from local windshield replacement installers in your area? FREE - no obligation whatsoever!